I like GMT games. They’re meaty. They’re complex. They are super thematic. They’re clever. They’re not for everyone, they’re usually not for beginners. Unlike some games the extra cost in complexity they demand is more than repaid in playability. They may look like a bunch of cubes on a map but then again a good book looks awfully like a bunch of words on a page. Triumph and Tragedy has been hanging around for a few months trying to break into our gaming night. 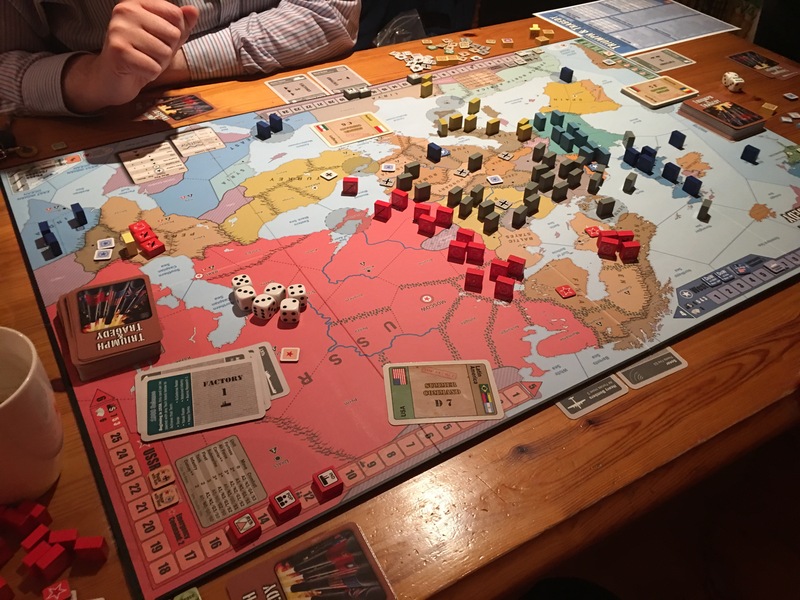 It’s a three player game and by chance the three people most interested in playing it found themselves together with it to hand on an idle gaming night. Oh boy is this a good game. 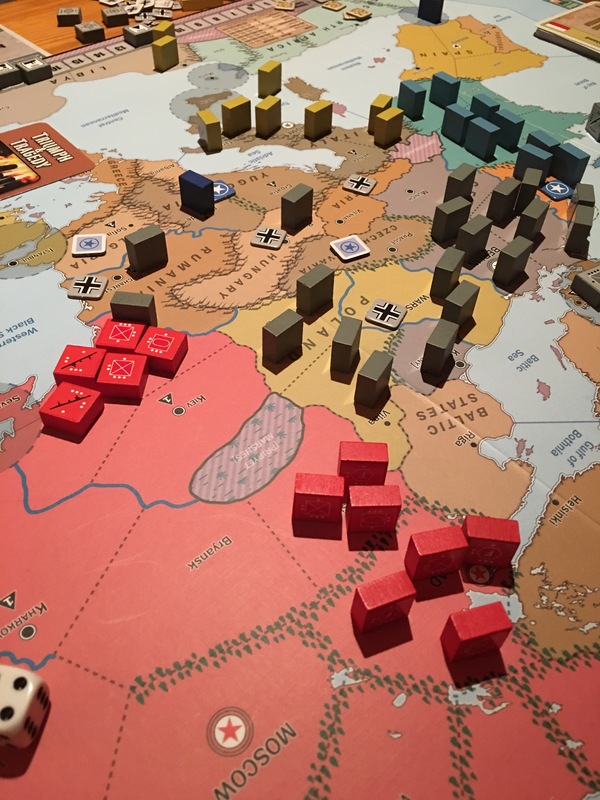 Triumph and Tragedy is a three player strategic war game where players take the roles of the premiers of Russian, Axis and Allied forces in the years 1936-1945. 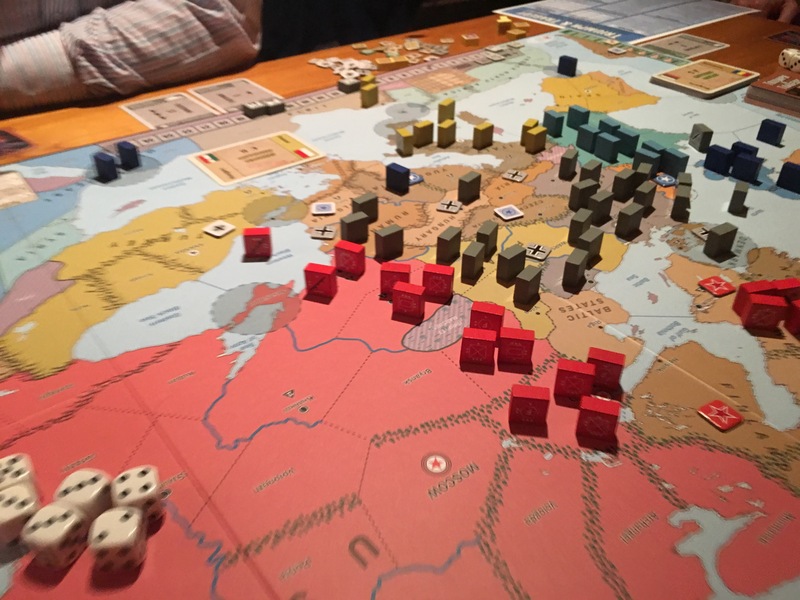 The three groups start on the map of Europe and parts of Asia, Africa and India with a stack of forces and by exerting influence, discovering technology, economy building and good old fashioned conquest vie to be the greatest power by 1945 or earlier if possible. So it’s WW2 for three players. It’s the economy stupid. Each player starts with a certain amount of factories, population and resources. The lowest of the first two is how much production you get at the start of your turn. When war kicks off it’s the lowest of all three so keeping a balance is key. Production can be used to buy and strengthen armies, buy action and economy cards. 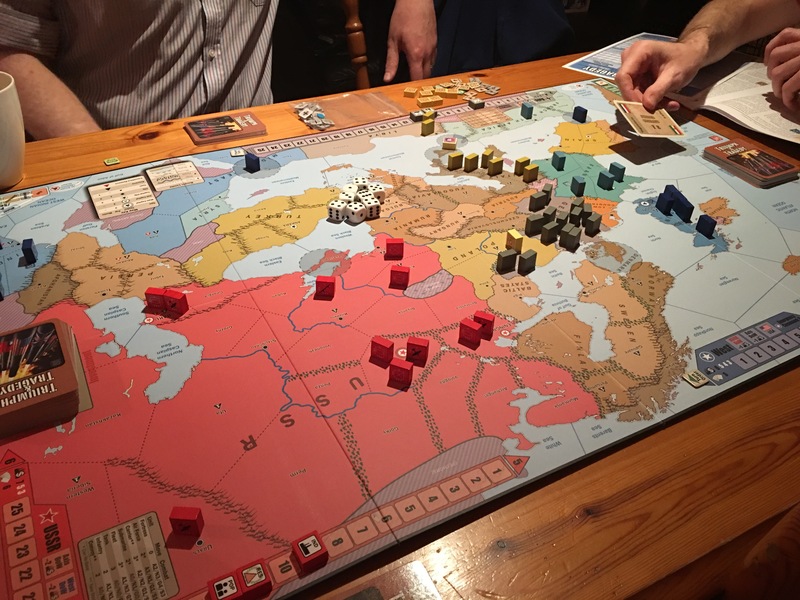 Each year represents a turn which starts with a buy phase (cards and armies), a political phase where you burn cards to influence countries to come over to your side and an action phase where armies are moved. Buying is easy you improve armies or raise new ones at home or buy economy or action cards. The political phase sees you burning action and economy cards. The catch is you don’t get free each turn all cards you pay for and the cards are multi function. Use them all up improving relations or building your economy and you don’t have them later on for moving troops. Now the meat and potatoes. The map is covered in little wooden rectangles with a sticker on one side facing YOU. So only you get to see what your forces are. Likewise you don’t know what you’re facing into apart from the number of little rectangles which could be infantry, armor, planes, fortresses, subs, aircraft carriers or ships. Each unit can be from strength one to three and units have a sort of rock paper lizard Spock advantage depending on what they are attacking or defending from. 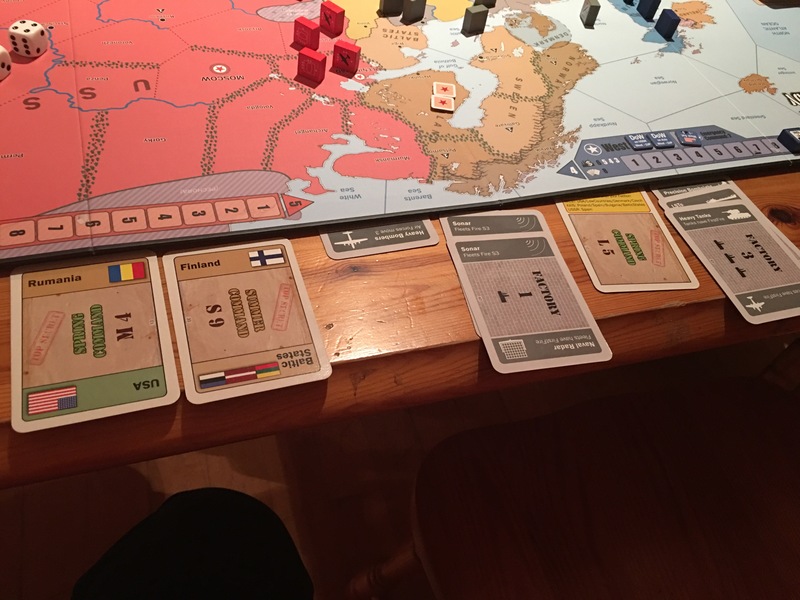 There are three movement phases per turn spring, summer and fall (four if your the Russians) and you get to move between four and nine units according to the card you play. The cards are marked as either spring, summer or fall and can only be used in that phase. cards also have a priority so a knowing when to go first or when to defend then counter attack later in the phase or season will win battles. I won’t get into the combat elements they’re pretty straightforward and dice based. More when I talk of this game again. This game has so many clever mechanics and the theme is so strong. Attack a neutral country will cause outrage giving your opponents a few bonus action cards, attack another nation and production capacities swap to a war footing (plus some outrage), stay peaceful and you can gain bonus prestige points which count at the end. 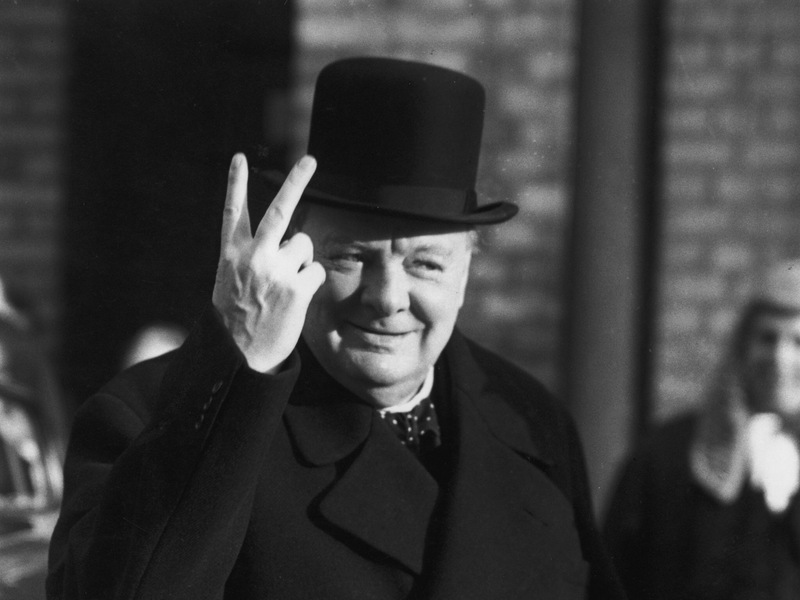 Best of luck staying peaceful. The whole game is beautifully poised from the get go. You need to expand to win (pretty much) but jumping in too soon or too late spells disaster. Messing up people’s plans is so much fun. In the game I played as Russia I spent a fair amount of time trying to subvert Spain and Portugal to my side thus giving me a base behind allied lines. These multiple headaches you have to deal with and can cause reminds me of Twilight Struggle. To a certain extent this is a three player twilight Struggle without the events. Even though it’s a long game time will fly by. It’s incredibly engrossing. There is little downtime as every action needs to be watched.